Various kinds of powder, cut materials and granules are sterilized continuously and instantly (four to five seconds), using superheated steam. Superheated steam with big thermal energy kills E coli, viable cells and thermoduric cells instantly. Short heating time, anaerobic atmosphere and constant temperature in the pneumatic pipes minimizes the product deterioration such as loss of active ingredients or oxidation. 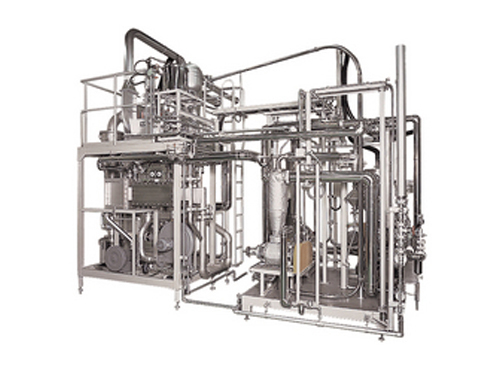 The changeable pressure and temperature make the system flexible for kinds of powder and granules. The pipe interior can be cleaned by flushing water from the material inlet, and dried with the inline heater. 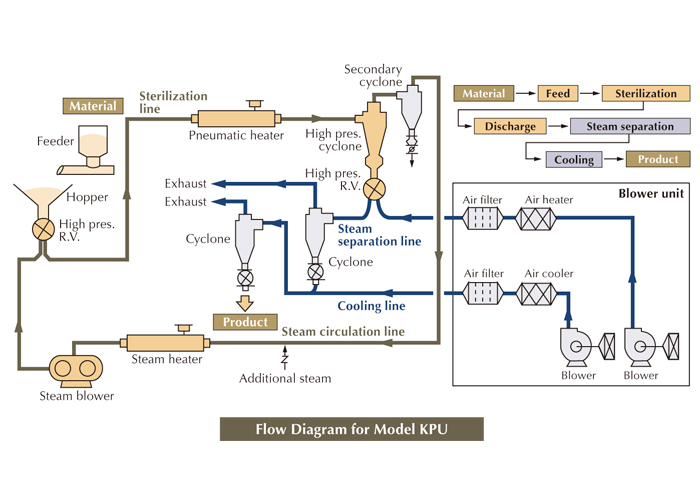 The recycling of superheated steam saves energy to increase the thermal efficiency. Spices / Herbal / Medicines / Health foods / Cereals / Fish powders / Dry vegetables / Tea leaves, etc. * Analysis method: Viable cell: By standard agar-agar plate culture Themoduric cell: By standard agar-agar plate culture (boiled for 10 minutes) E coli: By BGLB method Moisture: By drying method. ※ Above figures are subject to change in detailed design. ※ Installation spaces include operation and maintenance ones. ※ Capacities are for powders with bulk density of 0.5 kg/L. They depend on the material properties.